So simple to prepare, these little egg pies are my go-to recipe whenever I entertain. The flaky crust offers a nice contrast to the denser filling. These are light enough to munch on while guests are mingling, yet substantial enough to hold them over while I’m in the kitchen preparing the rest of the night’s offerings. The egg and thyme is a mellow flavor combination that gets a nice little kick from the cheese and red pepper. 1. Preheat oven to 375F. Prepare the quiche shells: roll out each pie crust per package instructions. Using a cookie cutter (or glass cup), cut out 12 circles, 3.5-4 inches in diameter. Press the pieces into ungreased muffin tins to form the shells. 2. In a medium bowl, whisk together the eggs and the rest of the ingredients, except the cheese. 3. 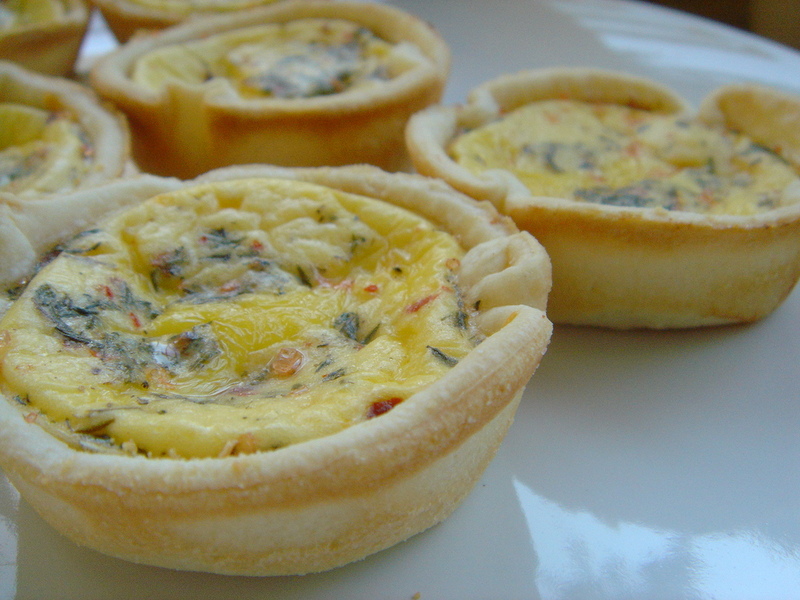 Divide the egg mixture evenly into each quiche shell, but careful not to over-fill. 4. Divide the cheese evenly over the tops of each quiche. 5. Bake at 375F for 15-20 minutes, until egg mixture is set. * To make a few extra quiches: when cutting the shells, collect the dough remnants into a ball, roll out, and cut away!